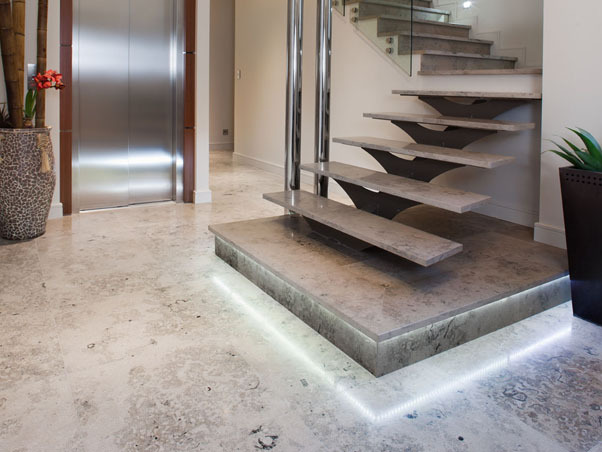 The treads at the bottom of the staircase were cut from 30mm slabs of blue limestone before the sides were honed to match the tops. These were supported using a steel frame which left the risers open before the staircase turns on the half landing. Contemporary design combined with beautiful natural stone which is also durable. The end result was a complete success which is a perfect example of how natural stone in the right hands can be versatile and practical. Please call or email if you have any queries at all. We are happy to assist wherever possible with your stone requirements.